Sometimes you come across a set of wines that really blows your mind. Really. ...conflicted not about their quality, or their authenticity or their ability to offer really unique and delicious accompaniment to a very wide range of dishes, but because they are so fantastic and out of the ordinary that you don't even really know how to effectively communicate their sheer awesomeness. 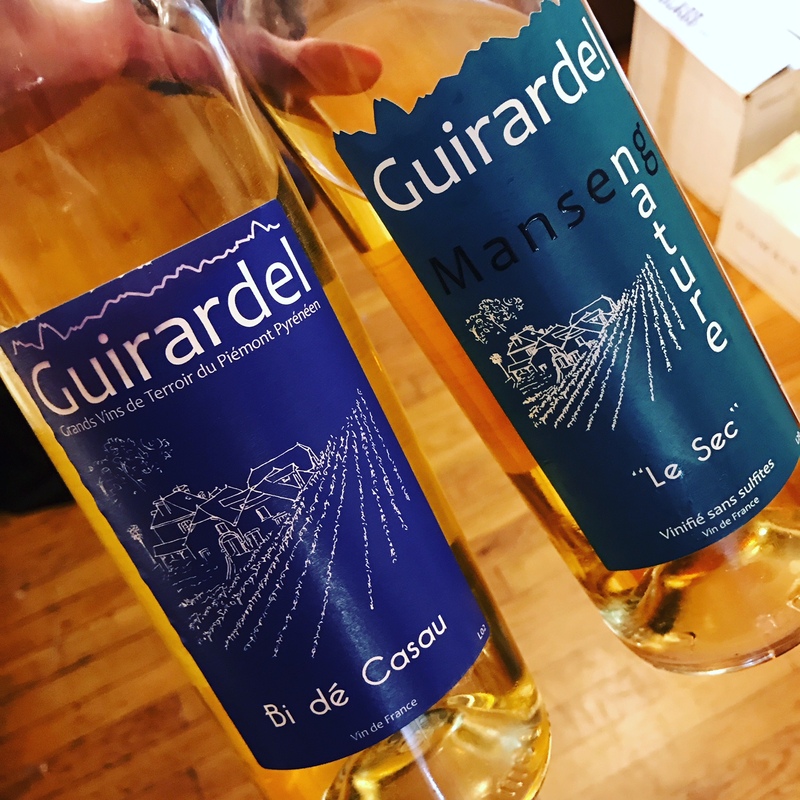 Domaine Guirardel is a tiny producer who occupies a beautiful, south-facing, totally isolated hillside overlooking the Pyrenees in the Jurançon region of Southwest France. 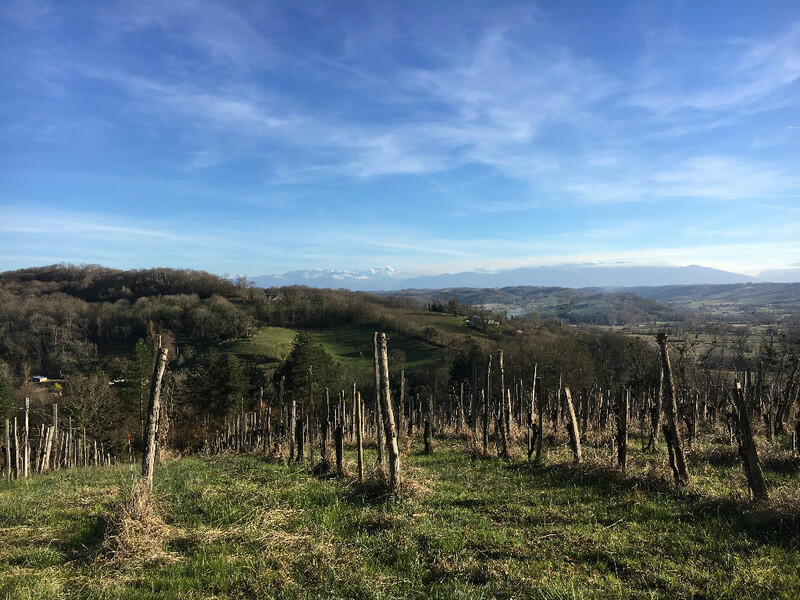 They represent fifteen generations worth of winemaking in the area and, since 2008, have been fully committed to agriculture biologique - producing their wines as naturally as possible. the last few producers of authentic, high-quality wine in the region. Okay, enough of the details, let's talk about these two unbelievably good wines. First, we have their demi-sec, called Bi dé Casau. It's a classic off-dry country French white that just screams for a cheese spread, or saucisson sec, or duck confit, or really spicy food like Indian or Thai. It offers a kaleidoscope of flowery aromatics, fantastic texture and racy acidity all with just the right amount of sweetness. Think a more herbaceous/spicy version of Chenin Blanc and you'll get a pretty good idea. It's really tasty stuff. Then we have the wild one of the pair...the 'Le Sec'...which they classify as one of their 'raw' wines (meaning no SO2 added) and this one is where things kick into crazy mode. On the nose, it has that interesting nutty/metallic thing going on, which led me to believe it was going to be one of those funky oxidative natural French whites, but on the palate it's a whole different ball game. Here you have an explosion of yellow/orange fruit that intermingles with a creamy/baking spice element and then somehow manages to finish completely dry. It's easily one of the most compelling white wines I've had in quite some time and I really look forward to drinking some this Summer, ideally with some fire-roasted pork. These are two totally awesome wines that, I think, will totally open a new realm of taste for you. Of course, like all things boutique/unique, there's not a whole lot to go around. 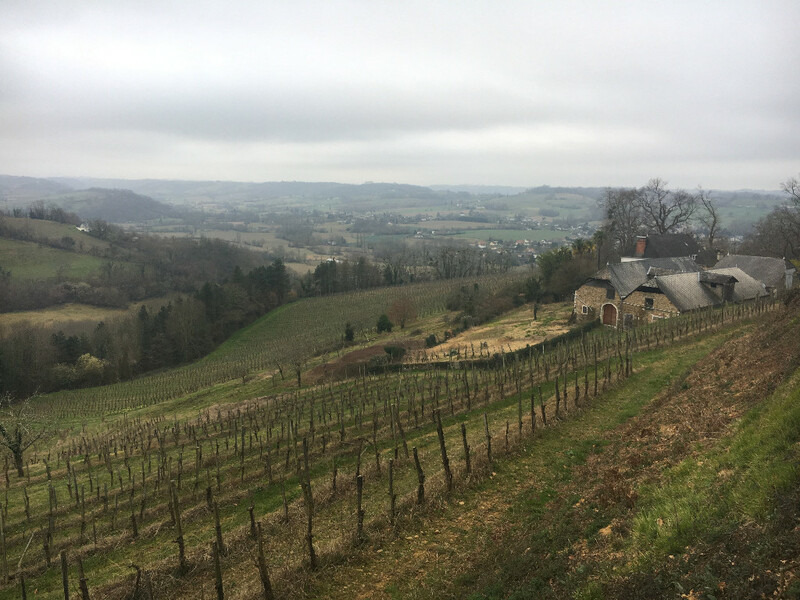 I also should point out that they purposefully don't classify their wines as Jurançon because they feel that the AC's reputation has been so damaged by the shift towards bulk production.